Are you seeing this symbol on your dashboard? Then you are experiencing a problem with your ABS system and you should take action right away. In this article, we will discuss the function of the ABS Light and how to locate the problem and repair it. Let’s go! 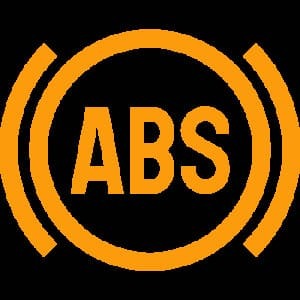 ABS stands for Anti-Lock Brake system. When your ABS light is displaying on your dashboard, it indicates that there is a problem with your anti-lock brake system. It could be a faulty wheel sensor, faulty ABS-ring, a wiring issue or just a blown fuse. When your ABS light is on, you have a stored trouble code in your ABS system or the car does not have communication with your ABS control module. What is the purpose of the ABS system? The ABS system is made for your security. If you are emergency/panic braking because of a sudden obstacle, your wheels will probably be fully locked and you will not be able to steer the vehicle. The anti-lock system is not allowing the wheels to fully lock up and it will help you to steer at the same time as you are pushing the brake pedal as hard as you can. It can be the difference between life and death. You have probably felt the brake pedal “Pulsating” at some time when you were braking on a slippery road. The pulsating/vibration that you are feeling in the brake pedal, is the ABS working to not lock the wheels. The ABS system can work in some different ways, but the main principle is the same. You have one ABS control unit, hydraulic modulator and a pump that is the main part of your system. You do also have one sensor on each wheel that is checking the speed of each wheel and a sensor on your brake pedal or inside the ABS unit to measure how hard you are pressing the brake pedal. It does also work together with the Traction Control System. The ABS system does often also have an Anti-spin and Anti-skid system inbuilt with your ABS and because you have one sensor on each wheel, it can see if one of the wheels speed is different from the others. If it notices that one wheel have a different speed than the others, it will brake down the other wheels so you will not get a skid or spin. The ABS modulator is restricting the brake fluid pressure to your wheels so you will not lock them up at all of the time and it makes the pressure to pulsate instead. The ABS control module controls how much it will restrict the brake fluid pressure based on the speed of the wheels and how hard you are pressing the brake pedal. But if it is releasing the pressure, will the braking distance be longer? Yes, an ABS-system will make you braking distance slightly longer. But it is much better to be able to steer your vehicle while you are panic-braking to avoid any objects in your way. If you have driven on a slippery/icy road before without an ABS system, you have probably noticed how scary it is to brake when you can’t steer at the same time. Your car will only continue in a straight way forward. It is not safe to drive with the ABS Light if you are not experienced in driving cars without ABS. The ABS helps you to steer at the same time as you are pushing the brake hard. Without experience, you will lose the steering ability in a panic situation. When your ABS light is on, it does indicate that there is a problem in your ABS system and it will shut your ABS system off. If your ABS light appears when you are out and driving, you should drive your car to a mechanic workshop as fast as possible. You should not keep driving your car with the light on if you do not feel comfortable. How to diagnose the fault in my ABS system? Your ABS light is on because there is a fault stored in your system. You should always begin to read the DTC memory to see what the code is saying. Do not just guess on parts that could be damaged, you will only waste your money. You could either let a mechanic workshop to read the DTC memory for you or you can do it yourself at home if you have a scanner. If you want to get an OBD2 scanner to read the codes from your vehicle yourself, check our OBD2 scanner review. Notice that the most cheaper OBD2 scanners can only read the engine memory. 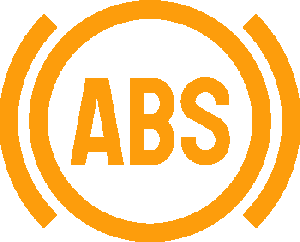 If you want to read the ABS system you have to read the description carefully to make sure that it works with your car model. When you have found a trouble code you have to find information about possible causes and solutions. The most OBD2 scanners have an inbuilt DTC library where it will give you some possible causes and solutions, but you should always diagnose it properly before replacing any parts. A good way to find a faulty ABS sensor or ring is to check the Live Data in your OBD2 scanner. Check all 4 wheel speeds to see if one wheel is going slower or faster than any of the other. If there is a difference you do probably have a faulty ABS ring, sensor or wirings to it. You can often monitor your electric parking brake with there OBD2 scanners also. When the ABS light is ON, your ABS function will not work at all. It could be dangerous to drive with your ABS light on if you are not comfortable with it. Always read the trouble code memory before you are trying to do any repairs to the ABS system. If you do still have any questions about the ABS system or want to tell your story about the ABS, comment down below. If you have any other car questions you are welcome to ask us for free at our homepage.